(CBS/AP) PARIS - Socialist François Hollande defeated conservative incumbent Nicolas Sarkozy on Sunday to become France's next president, heralding a change in how Europe tackles its debt crisis and how France flexes its military and diplomatic muscle around the world. Sarkozy conceded defeat minutes after the polls closed, saying he had called Hollande to wish him "good luck" as the country's new leader. Exuberant crowds filled the Place de la Bastille, the iconic plaza of the French Revolution, to celebrate Hollande's victory. He will be France's first leftist chief of state since François Mitterrand was president from 1981 to 1995. CBS News correspondent Mark Phillips reports Hollande had campaigned on a platform of reversing the cost-cutting austerity measures that France and the rest of Europe have adopted. In his victory speech, he said he'd keep his promises. "The first duty of the president of the Republic is to bring together and link all citizens to communal action so as to face up to the challenges awaiting us, and there are many and they are heavy: First of all, to increase production in order to get the country out of the crisis, reducing our deficit in order to control debt, the preservation of our social model to ensure to all the same, equal access to public services," Hollande said. Hollande also extended a gracious greeting to the Sarkozy after an occassionally vicious campaign. "I give a Republican salute to Nicolas Sarkozy who has led France for 5 years and who deserves all of our respect," Hollande said. Sarkozy thanked his supporters and said he did his best to win a second term, despite widespread anger at his handling of the economy. "I take responsibility ... for the defeat," he said. Just who is Francois Hollande? Hollande's former partner and mother of his four children, Segolene Royal, said she has a "feeling of profound joy to see millions and millions of French renew the tie to the left." "The French can be confident," she said on France-2 television. "We will need everyone to help the country recover." Royal faced off against Sarkozy in the 2007 election. Partial official results, with about half of the nationwide votes counted, showed Hollande with 50.8 percent compared to 49.2 percent for Sarkozy. 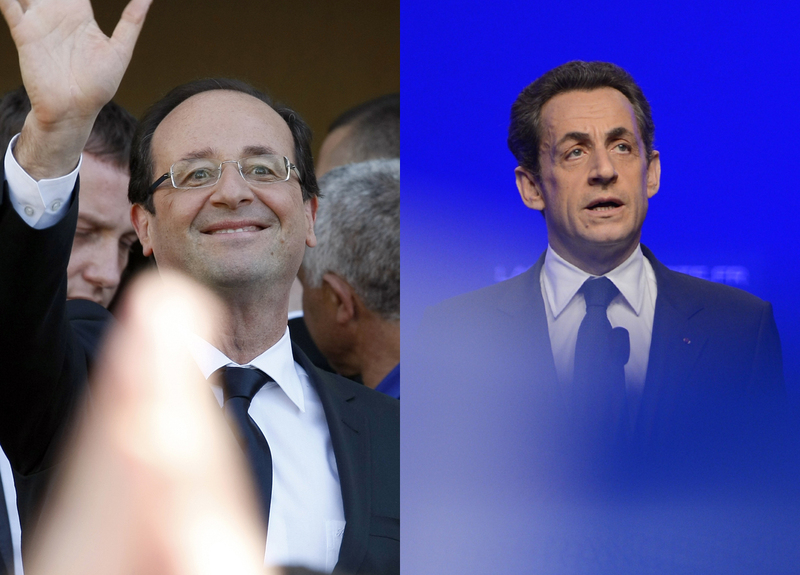 The CSA, TNS-Sofres and Ipsos polling agencies predicted that Hollande will win with 51.8 percent to 53 percent, compared with 47 percent to 48.2 percent for Sarkozy. They made projections based on the vote count at select voting stations around the country. Hollande wants to renegotiate a hard-won European treaty on budget cuts that Germany's Angela Merkel and Sarkozy had championed. He wants more government stimulus, and more government spending in general despite concerns from markets that France needs to urgently trim its huge debts. The election outcome could also have an impact on how long French troops stay in Afghanistan and how France exercises its military and diplomatic muscle around the world.